JZ of Tasty Treats has awarded me with Yummy blog award. Since I have already received this award, I am posting the link to that post. Soak the rice and dals for atleast 3 to 4 hours. Grind it along with green chillies to a coarse batter. For making adais...add the rest of the ingredients and mix well. Spread out on a hot tava with some oil in the sides. Cook till it starts turning brown. Cook on the other side as well and serve hot. This is a very popular side for Pongal in South India...although the eggplant version of the same is more common as compared to the capsicum version. Heat oil, add mustard and blackgram dal. When it splutters, add ginger paste, curry leaves, green chillies, turmeric powder, capsicum cut into small pieces and tomatoes. Fry for a minute and add tamarind extract. When it comes to a boil, add salt, green gram dal and mix well. Cook for five minutes on low flame. Serve with pongal, idli or dosa. Goes well with rotis too..
Heat oil, add mustard and cumin seeds. When it splutters, add the green chillies, curry leaves, turmeric and ginger paste. Add the cooked dal and salt. Cook for five minutes till all the ingredients blend together. This recipe is adapated from Viji's version at Vcuisine blog.. Grind the nuts together and marinate the paneer pieces for about 30 minutes. Heat 1 tsp of oil and fry the paneer pieces without the nuts gravy. Heat one more tsp of oil and butter and add ginger, green chillies, bayleaf, cloves, cardamom, all the dry powders, kasuri methi, curds, nuts gravy and some water. Let it come to a boil. Add salt, paneer pieces and channa and cook covered to get a thick gravy. Garnish with finely chopped coriander leaves and serve with plain rice or rotis. Sending this over to Vandana's Paneer:A Delicacy event. Fry the baby potatoes in oil till light brown. Keep aside. Heat oil, add all the other ingredients including the masala paste. Fry the masala for some time. Add the fried potatoes and pressure cook till potatoes are soft. This is my contribution to Spicy Tasty's Fortune Cooking event. I selected the star sign of Aquarius and hence have cooked using potatoes. Soak saffron in a bit of hot milk. Heat the milk along with the nuts, cardamom and saffron for five minutes. Add sugar and cardamom and mix well till sugar melts. This is my contribution to the Think Spice: Think Cardamom event being guest hosted by this blog..A small reminder to those who want to be a part of this event, We have just five more days to go for it..So, pls rush in your entries. Heat oil, add mustard and bengalgram dal. When it starts spluttering, add the rest of the ingredients and mix well. Garnish with coriander leaves. Cook the rice and dal together. Heat oil, add mustard seeds, bengalgram dal and blackgram dal. When it splutters, add curry leaves, cashews and vegetables and cook for some time till soft. Add the masala to it and fry well for five to ten minutes. Add tamarind water, salt, turmeric and the cooked rice and dal. Mix well. Serve hot with a bit of ghee, chips or raita. Heat oil, add mustard and cumin seeds. When it splutters, add the rest of the ingredients and mix well. Roast on medium flame for 5 minutes. Apply butter to one side of each bread slice and keep ready. Heat oil, add cumin seeds and ginger paste. Add turmeric, red chilli powder, garam masala powder, kasuri methi and the boiled vegetables. Add salt as per taste and mix well till there is very less moisture in it. Spread out the filling on the non-butter side of the bread and cover it with another slice of bread. Toast them in the sandwich toaster till light brown. Optional: You could even spread some green chutney over the bread slices on the non-butter side. Thanks Meera of Enjoy Indian Food blog for considering me worth the You make my day award..
TBC of The Budding Cook.. This paratha is a small variation to the dal chapatis I had made some time back..
Just add some cooked and slightly mashed peas to the ingredients before preparing the dough and then go ahead as usual...It definetely is a good change to the usual parathas..
Pressure cook all the dals together with turmeric and mash well. Heat oil, butter and add cumin seeds, cinnamon, cloves, cardamom, bayleaf and red chillies. Then add ginger paste, turmeric, tomato sauce and red chilli powder and mix well. Add the dal, salt and cook well till the dal blends with the masala. Mix the vegetables and paneer together and add 1/2 tsp of turmeric and red chilli powder, salt, cornflour and make small balls of it. Fry a ball first in hot oil and check if it doesnt seperate. If it breaks, add more cornflour to it and deep fry all the balls till golden brown. Heat oil, add cumin seeds and when it splutters, add tomato paste. Add the turmeric, red chilli powder, garam masala powder, crushed kasuri methi and cook for 2 minutes. Add some water to it and let it boil. Make a thin paste of corn flour with water and add to it to get a thick gravy. Before serving, heat the gravy and add the balls to it. Serve immediately with rotis or rice. This is my mother-in-law's preparation. Remove the skin of the mango and grate it. Heat oil, add mustard seeds,fenugreek seeds and asafoetida to it. Add the grated mango and mix well. Dont add any water to it. Add turmeric, chilli powder and salt and mix well for some time till the raw smell goes off. Cool and store under refrigeration. 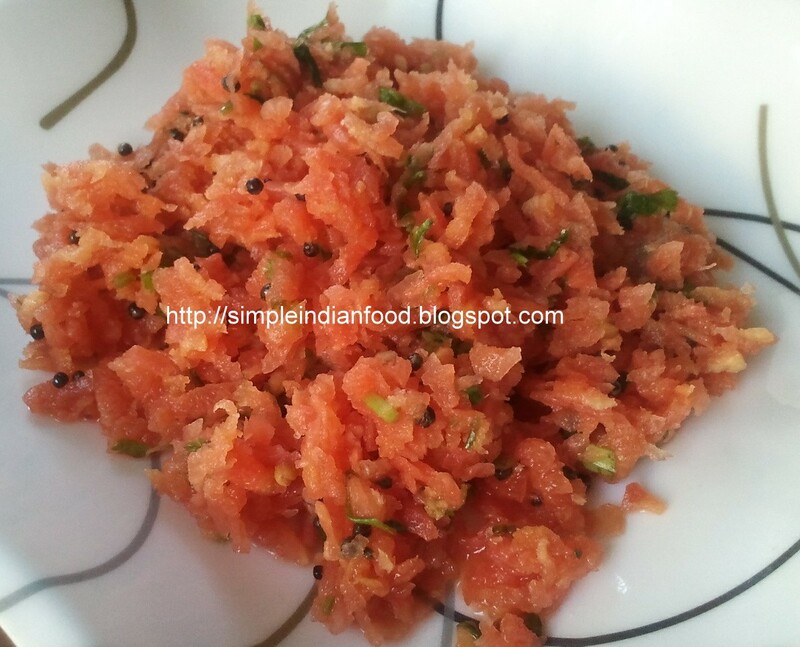 A nice side dish for idli,dosa,chapatis and even rice. Make a soft dough of wheat flour, salt and water and keep covered for half an hour. Mash the carrot, peas and add salt, turmeric, red chilli powder and ajwain to it and make small balls of it. Roll out the dough into a thick chapati, place the filling in between and close from all sides. Roll out again into thick parathas. 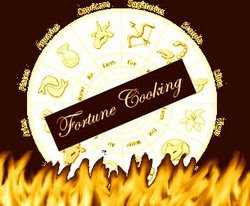 Cook on medium flame in a hot tava by spreading a little oil in the sides till golden brown spots appear on both sides. Finally add some ghee over it just before serving. This recipe from adapted from Indira's Paneer Kadhi with a very minor change..
Heat oil, add the cumin, mustard and blackgram dal. When it splutters, add the ginger paste, green chillies, turmeric powder, amchur powder, kasuri methi and then peas. Add some water, sugar, salt, paneer and whisked curds to it. Mix well and let it come to a boil. Garnish with coriander leaves and serve hot with pulkas or puris or plain rice. Steam the vegetables and squeeze out all the water from it to make it very dry. Add salt, green chillies, 1/4 tsp ginger paste, half of pepper powder, soya sauce, red chilli sauce, corn flour and cooked rice. Mix well and make small balls of it. Deep fry them in hot oil till golden brown. To make the sauce...Heat 2 tsp oil and add the rest of the ingredients to it and cook well. To make dry manchurian, just add very little water, bring to a boil and add the balls to it and mix well. To make it a gravy, add about 1 cup of water, let it boil and then add a thin paste of cornflour with water to it. When it starts boiling, it will get thick. Add the balls just before serving. Drain out the water in the dal and grind it to a coarse paste with very less water. Add salt to it and mix well. Heat oil and make flat vadas of these. Deep fry on medium heat till golden brown. Heat oil in a seperate pan and add the cloves, cinnamon, bayleaf and anise seed. Add the tomatoes to it and a little water. Cook till the tomatoes become soft. Add turmeric powder, red chilli powder and garam masala powder to it. Add the masala paste and salt to it and cook for 5 minutes. Add a cup of water to it and allow it to boil. Now add the fried vadas to it and cook covered till the vadas take up the entire gravy and become very soft. Vadai curry is a very popular side dish for idlis. Soak rice, poha and fenugreek seeds in sufficient water for atleast 2 hours. Grind to a smooth batter and add salt to it. Ferment overnight. To make dosas...add the curds and mix well. Pour a big ladle of batter on the tava and dont spread it like the normal dosas. Spread out a bit of oil on the sides and cook both sides. Serve hot with chutney/sambar or any curry. Cardamom (Elaichi, Yellakka, Yellakki, Elakka) is mainly a herb that takes the form of a small seedpod. There are two types of cardamom..green and brown, popularly known in India as choti elaichi and moti elaichi. Green cardamom is the more widely used variety and is a key ingredient in enhancing flavours in desserts, gravies, garam masala, tea and coffee. It also has medicinal values and is used to treat infections in teeth and gums, to prevent and treat throat troubles, congestion of lungs and pulmonary tuberculosis, inflammation of eyelids and digestive disorders. The Think Spice event is the brainchild of Sunita from Sunita’s World. This month's Think Spice theme is Think Cardamom and this blog is proud to guest host the edition. 1) Post a recipe with cardamom as one of its key ingredients. You could use green cardamom or brown, whole or powdered. Make sure that the flavor of cardamom is the highlight of the dish. You could even post about the benefits or other information related to cardamom. 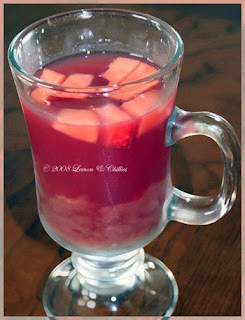 If you are a non-blogger, mail me the recipe and the picture. That will be included in the roundup. 2) Link back to the event and if possible please use the logo. to easycrafts@gmail.com on or before 25th May '08 and the roundup would be up by the first week of June.